10 students of an elementary school in Taitung, Taiwan received their graduation certificates 5 meters deep in an underwater graduation ceremony. The spot for the ceremony was a local fishing spot 300 meters away from the beach and 5 meters deep. The land near the spot was decorated with red carpets and balloons to welcome the parents and students. 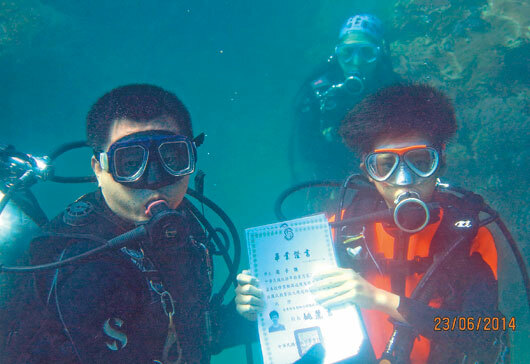 The graduating students received their graduation certificates from their principal underwater and posed for the memorable picture. Preparing for the event students received 3 days scuba diving training from the teachers of the physical education department at Taitung University. The principal of the school thanked Taitung University’s staff and faculty for the cooperation in making the ceremony memorable and outstanding.